What if dragons came to Fortnite: Battle Royale? Leaker FortTory found five eggs inside a prison cell under the castle in Polar Peaks. He got there using a glitch, and he was able to see the silhouette of dragon-like creatures inside the eggs. He shared a video of his finding on his YouTube channel last night. Related: Epic Games teased a new point of interest on The Block. FortTory is calling them “dragon eggs” because of the shapes inside them, and also based on previous information he found hidden in the game files after the 7.10 update. He had already found these eggs in models after that update along with a sound file with what seem to be heartbeats of the creature inside the egg. He also found an asset named IceCastle_Egg, which backs up his theory. The only information FortTory is still missing is what these eggs mean. Even if they are in the game for season seven and will eventually be accessible after more ice melts in Polar Peaks, it’s still unknown when or if they’ll hatch. 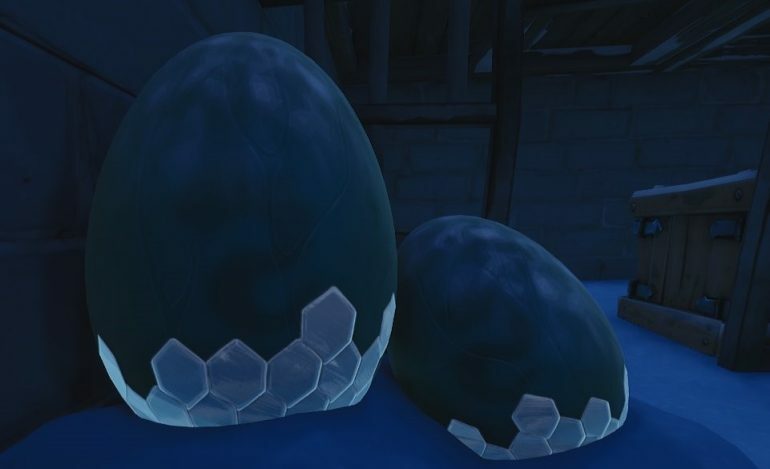 Our craziest wishes are for a season seven finale with dragons hatching from these eggs and wreaking havoc in the Fortnite island, possibly freezing the entire map or a huge part of it. They could also be friendly, for some reason, and become a crazy mount players can get when they drop Polar Peaks in the future. All we can do is guess for now. These eggs exist, they’re under Polar Peak, and there’s something living inside them. What will happen next is only a matter of time.